SAN MATEO, Calif. – Jan. 16, 2019 – Snowflake Computing, the only data warehouse built for the cloud, today announced the signing of a software licensing program (SLP) contract with the state of California. Snowflake is now listed as an approved vendor on the Department of General Services (DGS) website, where state and local public sector entities can procure Snowflake products and services. Government agencies will now be able to use Snowflake’s cloud-built data warehouse to get insight from all their data by all their users. In addition, they’ll be able to easily and securely share data in real time across all their business units, with other state agencies and with citizens. This is all made possible thanks to Snowflake’s key product benefits: secure data sharing, instant elasticity and per-second pricing across multiple clouds. With Snowflake, agencies can easily derive deep insights from data without the hassle and costs associated with existing legacy solutions. Snowflake’s unique difference with sharing data across and between agencies is that data doesn’t physically move. All other methods require moving data, which brings avoidable cost, risk, and headache. 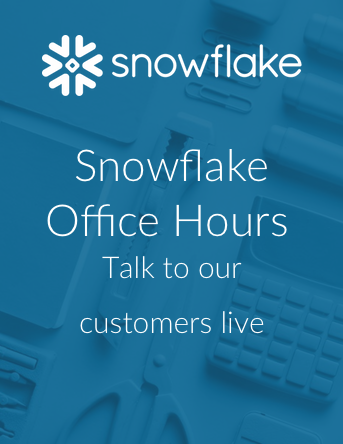 With Snowflake data is shared in a secure and governed way in real time by creating access to read-only copies of the data, a unique attribute of Snowflake’s cloud-built architecture. This means agencies have unlimited opportunities to integrate shared data with their own data, giving them a level of insight previously unattainable. Being part of the SLP simplifies the procurement process by making all deals subject to pre-negotiated terms and conditions with Snowflake’s authorized reselling partners. State and local agencies that want to buy Snowflake now have a simple method for procurement that includes partners certified Small Businesses (SB) and Disabled Veterans Business Enterprises (DVBE).